Seahorses may seem like mythical creatures, something you hear about but never see. But they are real and more common than most people realise, being found right around New Zealand. They are not easily found as their coloration blends in with the seaweeds they live in and even for experienced searchers they are easy to miss. New Zealand has only one species, Hippocampus abdominalis, one of the world's largest, growing to 30cm. In most harbours their numbers are diminishing because of silt runoff, loss of kelp forest habitat and collecting. Under New Zealand's Fisheries laws any person can legally collect 50 seahorses. For most harbours this would be most, if not all the population. Trade in seahorses as aquarium pets is having an effect on the wild population although this is offset now by most sold in pet shops being bred in captivity. Some cultures dry the seahorses and they become aphrodisiacs or are used in traditional medicines. Because of this, the international trade in seahorses or products made from them is controlled under CITES (The Convention in Trade of Endangered Species). But in New Zealand estuarine populations are constantly at risk because of overfishing. Often the methods used to catch seahorses, destroys the kelp and sea weeds in which they hide and hunt for food. 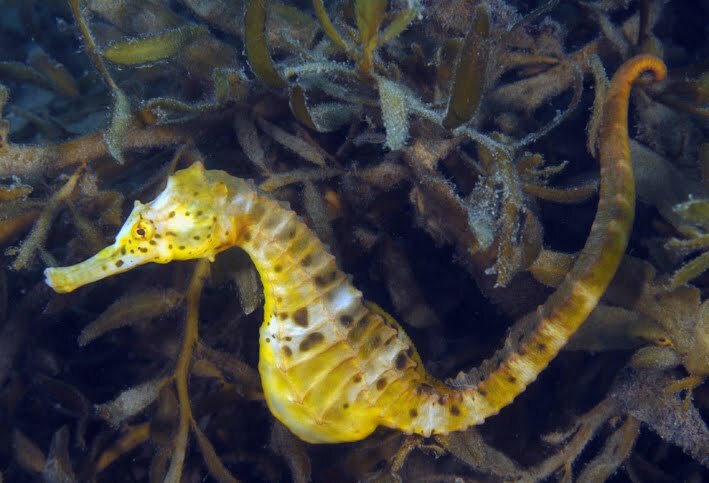 Write to the Minister of Fisheries and suggest that seahorses deserve a little more protection than a daily catch limit of 50 animals per person a day.